WEST HEMPSTEAD, Long Island (WABC) -- Service has been restored on the LIRR West Hempstead Branch after an unauthorized vehicle on the tracks was struck by a train Monday morning near Westwood Station. 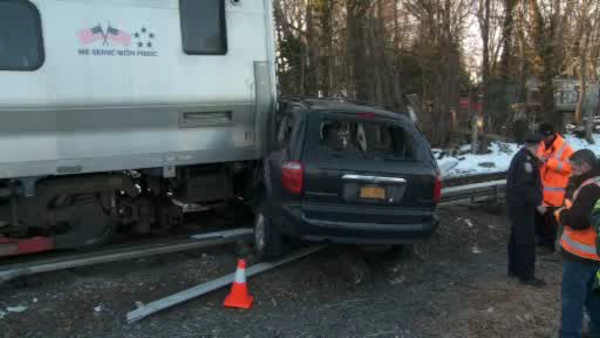 The train struck the car at the Franklin Avenue crossing in Malverne. The driver of the vehicle was removed and taken to the hospital. The LIRR says preliminary reports indicate the crossing gate was down and the driver went around it at 7:15 a.m. The accident caused service to be suspended in both directions during rush hour. At least 200 people were on the New York City train and placed onto buses. None of the passengers were hurt. LIRR personnel were on the scene assessing possible third rail damage. The train was the 6:53 a.m. from West Hempstead, due at Atlantic Terminal at 7:41 a.m.